Thanks to more than a century anda half of wise stewardship, Bucknell's campus is graced by hundreds of trees, many of which were here when the university was founded. The Bucknell Arboretum project is an effort to map, identify, and measured each tree on campus to make this tremendous resource more readily available to the campus and Lewisburg communities and to provide guidance on tree planting for the future. 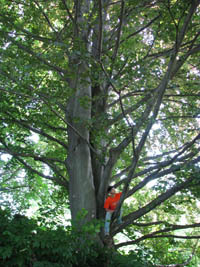 Daniel Wang climbing a remarkable copper beech, one of the largest trees on campus. Daniel identified and mapped over 1600 trees in summer 2008, thereby getting the Arboretum project well underway. 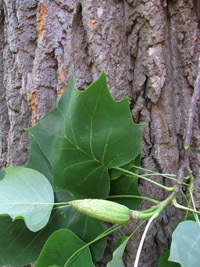 Leaves, fruit, and bark of a tulip poplar, another of the largest trees on campus. 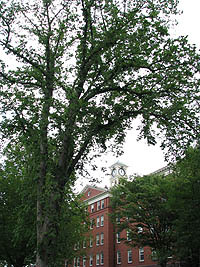 American elm trees were one of the most common tree on Bucknell's campus until Dutch elm disease killed most of them. This is one of the few survivors. The Environmental College has recently led an effort to plant disease-resistant American elms on the Dana quad. 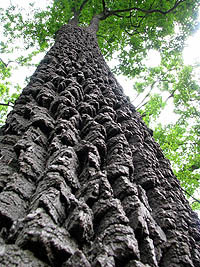 The American persimmon tree's deeply divided and scaley bark plates is one of its most distinguishing characteristics.